If you are looking for a Prosthodontist in Arizona, we welcome you to our practice. 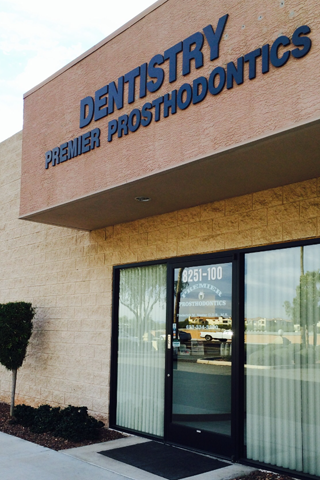 Premier Prosthodontics has been in the Phoenix Valley for over 15 years. Originally founded by Dr. Leonard Beare, Premier has serviced the community by offering a high quality and affordable services in cosmetic dentistry and oral surgery. Our dentist, Dr. Nester took over the practice in June of 2011 and has stayed committed to providing the same level of care the patients have come to love and expect from Premier. One of the goals of our Web site is to provide you with an extension of care. As you navigate through the site you will find a wealth of information about dentistry, tooth care, procedures and treatments. We believe our patients deserve to have the information needed to make wise choices about their oral health. There is an overview of our practice including our doctors and staff, office hours, appointment procedures, maps, directions and contact information. As licensed Prosthodontists in Arizona, we work with our patients so they can achieve and maintain a beautiful smile and healthier gums and teeth. We take the time with our patients to explain their treatment options and inform them of additional preventative care. Our main office is conveniently located in Peoria and we invite you to call with any questions or email us via the Contact Us page of our Web site. We will do everything possible to ensure you a pleasant visit.